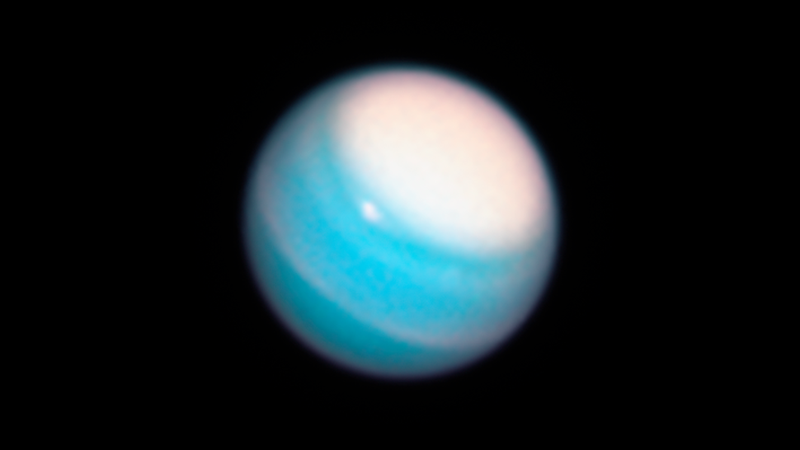 A massive white cap over the northern polar region of Uranus has grown substantially since it was first observed 10 years ago. Neptune, with the dark vortex at top center. Looking at the new Neptune image, it appears that a dark vortex has once again reared its ugly—yet fascinating—head. The new anti-cyclonic storm, seen at the top center of the photo above, is about 11,000 kilometers (6,800 miles) across. This is now the fourth dark vortex observed by Hubble since 1993. Two of these storms were observed by the Voyager 2 probe during its flyby of the system in 1989. Taken together, these observations affirm the transient and recurring nature of these storms. A polar vortex observed in 2016, for example, has largely faded away.